The Big Picture: December 2012 brought us to the conclusion of a record-setting year, with 363 new women director appointments (representing 351 women), 57 (or 18.6%) ahead of last year. 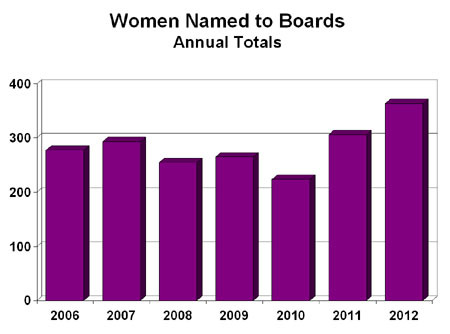 There were 22 new women director announcements in December 2012, as tracked by NewsOnWomen.com. 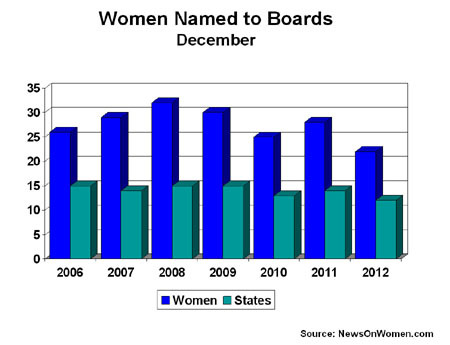 Companies in twelve (12) states added women to corporate board seats during the month. The History: This December capped a three month down-turn performance, in spite of the year's record including two months at 41 appointments. 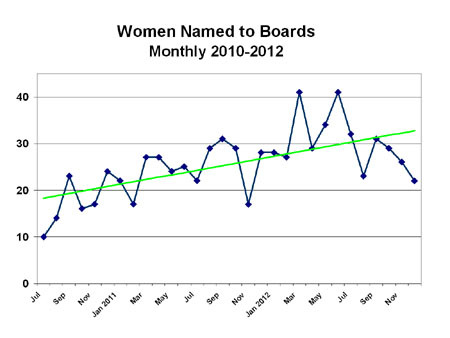 The monthly average for the year 2012 is 30.3 new women director appointments. We suspect that the uncertainty of the fiscal-cliff and the post-election posturing probably took a toll on both boards and women and their risk-sensitivies. What States? 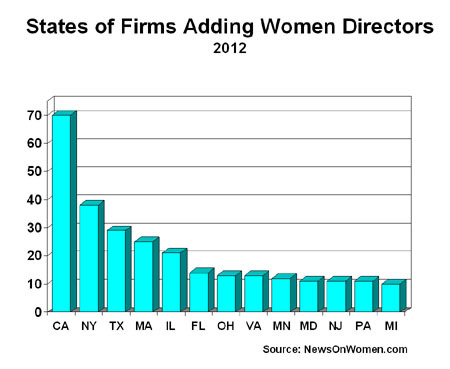 Companies in 12 states announced new women director appointments in December 2012, the lowest number of states since August with just 10. The average number of states with firms adding women directors remained at its peak of 15.3 per month this year, compared to below-13 states in every year since we began tracking appointments. 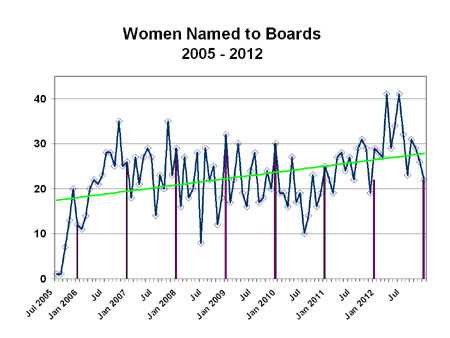 As an indication of the month's lethargy, California reported no new women director appointments during December -- a performance seen only a handfull of times since 2005: Feb 2010, Oct 2008, Apr. 2006, and Jul-Aug. 2005. Florida copmanies added 4 new women directors - a record for the state. New York, and Texas each added 3 new women directors. 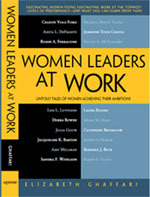 Illinois, New Jersey, and Michigan added 2 new women director appointments each. Six other states added one woman director each. California continued to lead the pack with a total of 70 announcements, 84.2% ahead of New York with 38, Texas with 29 and Massachusetts with 25. Thirteen states are in double digit appointments, while 12 states continue to have zero new women director announcements for the year. What Exchanges? During December, NYSE companies led the way with 11 women director appointments compared to 5 for NASDAQ-listed firms, and 5 for Private firms. 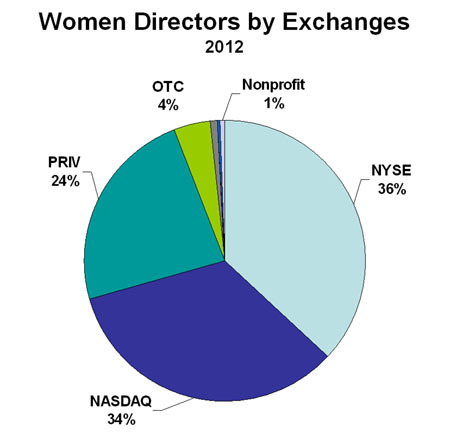 For the year, NYSE firms held the lead with 134 appointments (36.9%), NASDAQ had 122 new women director announcements (33.6%), and Private companies had 86 new women director appointments (23.7%). 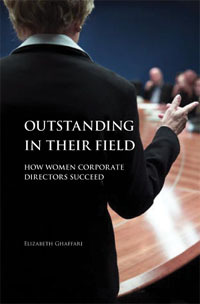 Another 18 new women directors were added to OTC/PINK firms, 2 to large Nonprofits and 1 to major Govenment boards for the year 2012. The monthly chart highlighting July 2010 to date (below) shows the steep overall rise over the past two years in spite of the last half year performance. The monthly data from July 2005 (below) shows a solid overall upward trend with sustained overall progress even with the 2007 to 2009 recession. 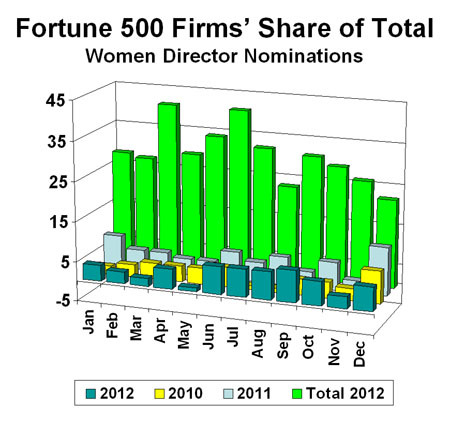 Fortune 500 Companies In December 2012, 6 of the total of 22 new women director appointments were at firms on the Fortune 500 list (27.3%), the second highest month as indicated by the teal colored bar on the chart below. All were appointed to NYSE-listed firms. This brings the 2012 annual total to 59 (16.3%) F500 appointments for the year, still significantly below annual levels of 2010 (19.2%) and 2011 (23.4%). Note: All figures reflect the information from press release announcements as tracked by NewsOnWomen.com for the period indicated. and our latest guest article posting at The Conference Board Blog. Contact: For questions regarding this report, contact: EG@ChampionBoards.com.